In the final day of a record-setting week of civil disobedience at the Capitol, more than 300 people were arrested Monday as they demanded democracy reforms. Yesterday's arrests came on the third and final day of Democracy Awakening. Combined with arrests made during the recent Democracy Spring, the protests constituted what organizers believe is a record for civil disobedience over democracy issues during this century. The message: On voting rights, money in politics and the recent vacancy on U.S. Supreme Court, Congress is failing to do its job and ignoring the will of the people. Democracy Awakening isn't the end of something, but the beginning of a new phase in the movement for democracy, organizers said. Those who planned to risk arrest included NAACP president and CEO Cornell William Brooks; the Rev. William Barber II, pastor and Moral Monday architect; radio commentator Jim Hightower; Ben Cohen and Jerry Greenfield, co-founders of Ben and Jerry's; Greenpeace Executive Director Annie Leonard; and Sierra Club President Aaron Mair. "I'm willing to risk arrest, arm in arm with partners from the civil rights and the labor movements, in order to help fix our democracy," Leonard said. "We will never get the kind of political progress needed to challenge climate change and systemic racism if corporate cash continues to mean more to politicians than the voices of the people." Our director @ AnnieMLeonard was among over 1,400 arrested for # DemocracyAwakening& # DemocracySpring this past week! "Democracy is supposed to be for all of us, but right now we have an out-of-balance system favoring the interests of big money," Cohen said. "This can't go on. I'm prepared to risk arrest to send a message that democracy should truly be of, by, and for the people." "At a certain point, you have to say enough is enough," Greenfield said. "I have decided to risk arrest because we can't continue to have a political system where ordinary people are shut out of the process. It's not what our founders envisioned, and it's not what democracy is supposed to be about." 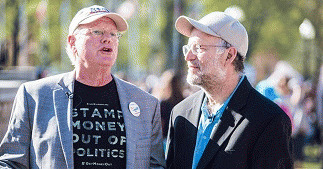 The cofounders of Ben & Jerry's Ice Cream were arrested during a protest on the steps of the U.S. Capitol on Monday, the company announced. "We cannot sit by and watch obstructionists push an agenda of inequity, injustice and inaction -- and I'm willing to risk being arrested in order to make my voice heard in in the fight to ensure that every voice can be heard in our democracy," Mair said. "All too often, the costs of these assaults on our democracy fall on low-income communities and communities of color that already face disproportionate effects from pollution and the climate crisis. A zip code should never dictate the destiny of any American citizen." Thousands of activists from around the country streamed into the nation's capital April 16-18 for Democracy Awakening, which featured teach-ins, a rally, a march and lobbying as well as the civil disobedience. The aim: to fight back against business as usual in Washington, DC. More than 300 organizations endorsed Democracy Awakening. Democracy Awakening is part of a broad movement aimed at advancing democracy reforms. The mobilization began April 2, with Democracy Spring, an event that featured a march from Philadelphia to Washington D.C., followed by six days of sit-ins at the Capitol. Others who planned to risk arrest included top leaders of the AFL-CIO, All Souls Unitarian Church, the American Federation of Government Employees, the American Postal Workers Union, Campaign for America's Future, Democracy Initiative, Center for Popular Democracy, Communications Workers of America, Ella Baker Center for Human Rights, Every Voice, Food & Water Watch, Franciscan Action Network, Free Speech for People, Friends of the Earth, Greenpeace, the International Brotherhood of Teamsters, the International Union, United Automobile, Aerospace and Agricultural Implement Workers of America, Jobs With Justice, the Metropolitan African Methodist Episcopal Church; the NAACP, Oil Change International, Public Citizen, Sierra Club, the United Church of Christ, the United Food and Commercial Workers International Union, We Are Casa, the Yes Men and 350.org.